Originally a war dog used in battles and fighting competitions, the Mastiff dates back more than 2,500 years ago. They descended from an ancient type of dog called the Molosser, and probably came from the mountains of Asia, Tibet, or northern India. They fought in arenas against gladiators, bears, and lions. They were later used as guard dogs for estates and households. Mastiffs found their way around the world, transported by traders and armies. Wherever they went, they were prized for their courage and size. Mastiffs were used in England for the brutal sports of bull-baiting, bear-baiting, and dog fighting, and they almost became extinct when those sports were outlawed. Dog shows in the mid-19th century kept the breed alive. It is thought that a Mastiff came to America on the Mayflower. The breed also became in danger in England during World Wars I and II due to the high cost of feeding them; however, Mastiffs were being imported to the United States and Canada, and today they are very popular. Mastiffs are often called “the gentle giant.” It is in their nature to defend their territory and family; however, they rarely bark and are silent guards and will more than likely hold a bad guy at bay, either by trapping them or lying on top of them. 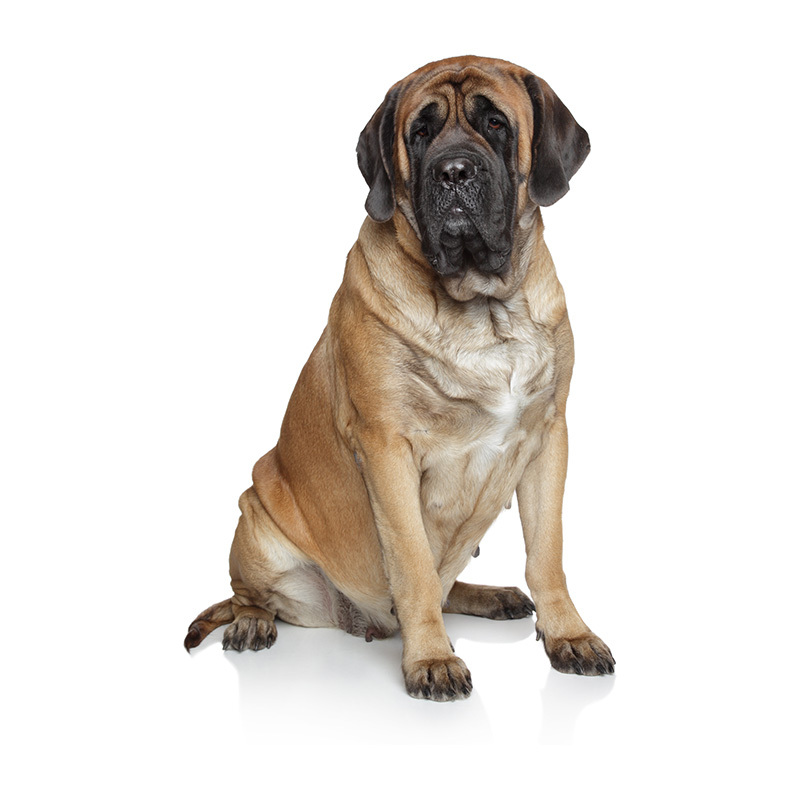 Mastiffs are self-confident, even-tempered, trainable, and patient. They are loving towards their family and are excellent with children. Mastiffs are calm and docile dogs who like to take naps. They also love to have a lot of attention and will dote and cuddle with you. Mastiffs are a smart breed and are eager to please you. They require an average amount of exercise; however, they’re not really into playing fetch. Mastiffs are loud snorers because they have a long soft palate, which is an inherited trait. These dogs make excellent family pets, as they are so loveable and protective of their families. Mastiffs usually weigh between 120 to 200 pounds and stand approximately 26 to 36 inches tall. They are extremely large dogs with a massive build. Their coat is short and colors come in brindles and fawn. The biggest Mastiff on record was an old English Mastiff called Zorba. He weighed 343 pounds and was 8 feet 3 inches from nose to tail, and was the heaviest dog ever recorded. Mastiffs are never white in color. Some famous Mastiff owners include King Henry VII, Hannibal, Kublai Khan, Marlon Brando, Bob Dylan, George C. Scott, and Kirsty Allen.